Now I can upload an image to FPN. Note that the maximum file size is 1 MB, see red underline and arrow on left (we only have limited file space on FPN). Since that easily caters for a large image (1000 pixels on the largest side easily), that shouldn't be a problem. There are two ways to upload an image, one is by supplying a url, from e.g., your Flickr site, or by direct upload from your hard disk. I want to select a file from from my HD and do that by clicking on the Choose button, see red arrow on right. In this case etruria02.jpg. Of course, next step is to click the Open button, which brings me back to the Upload screen. As you can see, the image name etc. is now displayed in the little Upload from HDD field. Next of course is to click on the Add Image button, where the red arrow is pointing, after which the image appears in the Upload screen. Since the image is reasonably large, dimension wise, more than the browser window is filled, so I am scrolling down through the window (as displayed here in 2 stages). 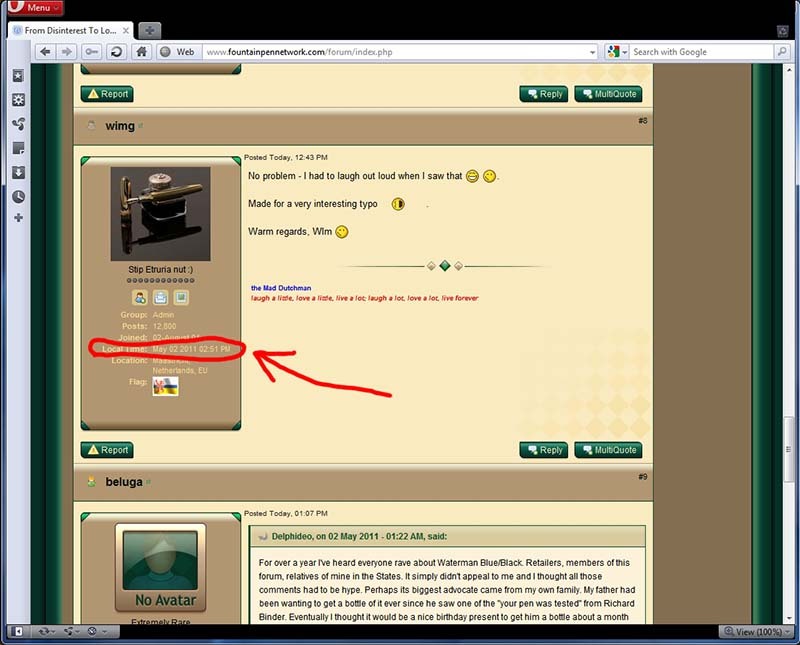 Of course, I click on Copy, as highlighted in the pop-up box.I need to go back to the message editor window now, so I scroll back to the top of this window, and there it is, to the left of the tab with the Upload screen I am looking at now, see red circle and arrow. Clicking on that tab, brings me back to my message editor window. Notice the weird code in my message. That is the BBCode we saw earlier. So, you may ask, what is the advantage of this? Well, it is faster than adding an image via the Add Image button, and it also makes for faster scrolling in the editor box when editing or creating a message.Well, you may say now, but I want to see the image in the text. To which I will reply again: you can. Click the Preview Post button at the bottom of the message editor box, and the message will appear with the image in all its glory. Here follows the result after clicking on the Preview Post button. The message has appeared. Since the picture is still large, I'll show it here in two parts again, scrolled through the browser window. I can continu editing now, add more images too if I like, do more Previews, and once I am happy and done, I can now scroll to the bottom of the page, and click on Post Reply, Post New Topic, etc., depending on what I was doing (creating a reply, a new topic, or maybe doing an edit). And that's all there is to it!Within Upload there also is the option to manage already uploaded images, including getting the codes again, but I leave you to play with that by yourself for now. Considering the most recent discussion and poll for a new forum, Visconti in this case, I guess now is the time for another attempt at explaning why and how of forums, etc. First of all, the brand forums exist because each of them either represents a brand with a large contribution in posts to the board as a whole, or because a moderator seen as an expert on the brand loved to moderate such a forum here. Next there are a bunch of general forums, such as News, New Members, and different types of pen related discussion forums Writing Instruments, Inky Thoughts etc. ), and I think I do not need to explain those. The regional forums were created when it was clear that some pens were discussed a lot, but not enough to warrant a forum by themselves. I'll come to those requirements just now. However, when combined as a regional group, for which there were no other forums yet, they did have enough weight, hence the Italian and Japanese pen forums. The forums in Creative Expressions were created for what we do with our pens, to show them off etc., so makes sense too if you'd ask me. Next there are a few community related forums, such as Chatter, Community Feedback, Members Helping Members, etc., which used to have the FS forums too. The latter were of course moved to Classifieds, which is really what they are, and they do deserve a section just for themselves anyway (and no, I do not plan on discussing that here, just so you know). 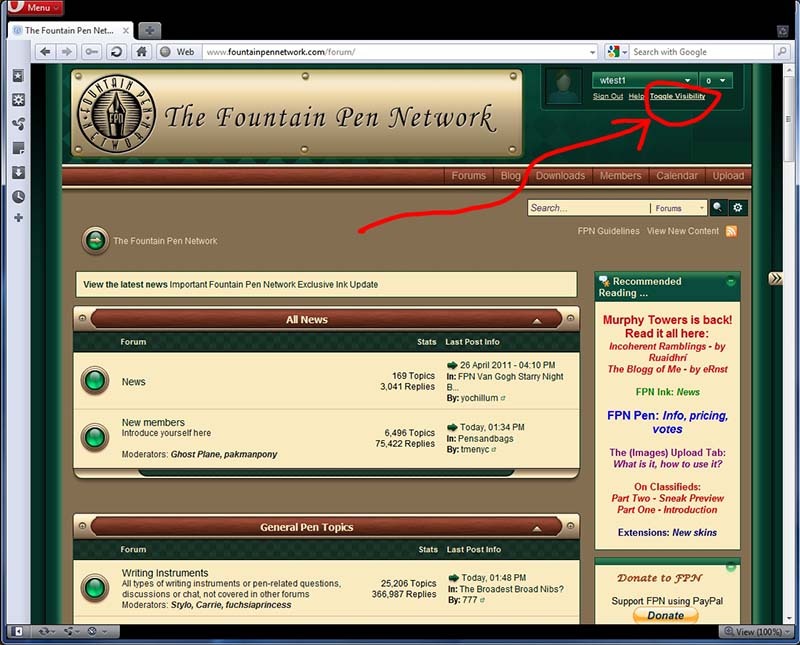 We also have a Projects Category, with currrently a single forum, namely the FPN LE Pens forum, only visible to those who ordered and paid for a pen, for status updates and the like on the FPN Pen project. Another important part of the board is the Reviews section or category, which was created in 2004 or 2005, I can't remember now, and which is really a very important part of this community, because it allows people to share their opinions on pens and pen related items, without bias from vendors etc. This, BTW, is the category that really made FPN fly from a Google rating POV. Finally there are a few forums which are only available to moderators and admins, in which we discuss devious plans to keep everybody here on their toes at all times . Just in case, as some people do not seem to realize yet: we do discuss all happenings on the forums and other sections in these forums, are in daily contact most of the time, and are always aware of what is happening as a result. Furthermore, the mod and admin team back each other up at all times . Niow, when do we consider it worthwhile to start a new forum, and what are the prerequisites? First of all, a new forum needs to take away at least 7% of traffic from Writing Instruments, otherwise it will just not fly - speaking from experience here. Secondly, we need at least two moderators who are able to work with the rest of the moderator and admin team. They have to fit in with the bunch of loonies we are, work with and in the team, and have to be able to cope with the stress involved - yes, at times it is very stressful, mostly because we really care about the people here and then FPN as a site itself. If those conditions are not met, we will not create a new forum. Also, we do not want to create a forum list that is longer than the list of messages posted here. With 1000-1500 new messages a day, the current structure works well enough. There are 800+ brands known worldwide, we will not create 800+ brand forums. Furthermore, a brand forum needs to be interesting enough to keep on generating new discussions. If a brand has only a short history, and few models, we will likely not create a forum for it. Neither will we do so if it attracts too few posts in general, as already stated above. Neither will we create forums for differently shaped pens, differently coloured pens, etc. Although this would make for interesting discussions, it is not really how the pen world works . The creation of a new forum, BTW, is a very painful thing to do. Topics have to be moved from one forum to another, which is a manual exercise, i.e., going through all topics and moving them more or less one at a time from WI to the new forum. That is another thing to consider, and therefore not something we will do just on a whim. It takes many hours to finish this process, and I am speaking fom experience here. The current thinking is that the structure here works very well, and that there is more gain to be had from implementing new functionality rather than new forums, hence the spate of introductions of new applications rather than forums in the last year or so, such as Classifieds, Downloads, Upload, Blog and the Store, and there are likely more to follow . However, more important currently is to upgrade the board itself, as a new version of the board software is already in its third incarnation (2nd upgrade) since late yesterday. We are still waiting for a few pieces of software to be upgraded as well, and then we will likely plan a day of downtime for the upgrade, but only after extensive testing on our test site. BTW, this also includes an improved version of Classifieds. In short, there is not going to be a Visconti forum any time soon. It doesn't warrant the creation of a (sub)forum by itself (and neither do Lamy and TWSBI), and there are still quite a few exciting updates and enhancements lying ahead of us anyway. Have you ever wondered about the skin we're using as the main board skin, and what ever happened to the old one, that nice paler blue and cream one, which was easy to read, with distinct differences between pinned topics and normal topics in each forum? And each of the latter two skins are rather limited of course, due to the fact that they cater really for as simple forum access as possible. Resulting in the above dropdown and selection list. 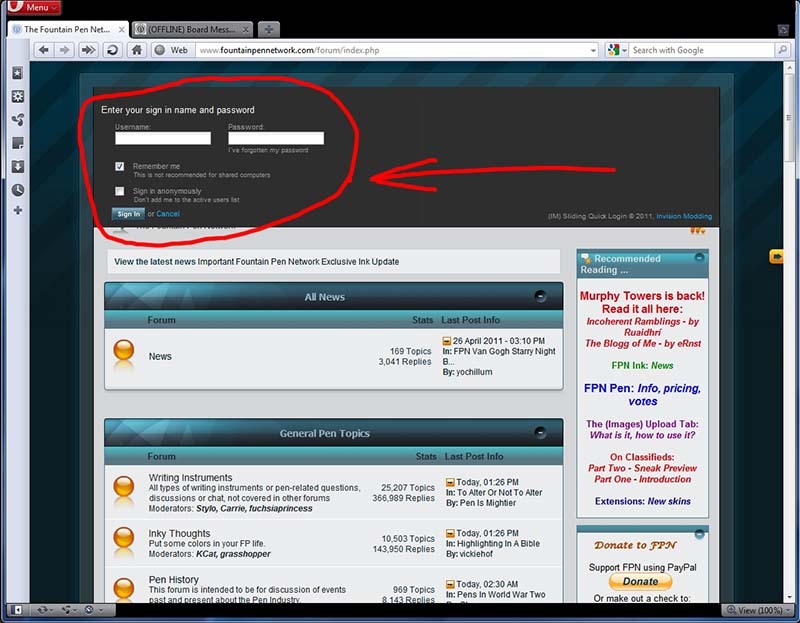 Just click on either, and that determines how your FPN experience is. Well, not being all that happy about these options, we decided to build a few extensions to our little digital nut house, make it look small from the outside, but extend it to a mansion from within . The rebuilding is more or less complete, so we would like to introduce to you a few new rooms and spaces, besides IP.Board, IP.Board Mobile, and Lo-Fi. There may still be a few hiccups here and there, as happens when extending a house, and of which we are aware, mostly, but we didn't want to keep these from you any longer regardless. 1) The Library - a room (skin) with the luxurious feeling of brass, wood paneling and leather, in marvelous shades of green, brown, cream and yellow copper, with an occasional red highlight.. This room is where you may find admins and moderators alike when they are relaxing after a hard day of moderating and administering . 2) The Vault - very much a technically oriented room, in the basement of the nut house, the place where we keep our server and software, where technical stuff resides. No distractions there, except for a few flashing lights. 3) The Zen Retreat - you can almost hear the grasshoppers chirping away here, while emptying your thoughts in a most pleasant and peaceful green-tinted environment with lovely paper lampshades and bamboo twigs all over the place. 4) The Armoury - our gun-metal grey room where we don our suits to fight spammers, hackers and other unwanted intruders. Sparse and relaxing somehow. 5) The Hangar - a high tech blue tinted place where we store our Virtual Space Exploration machinery, and any other transportation equipment we need on our treks. 6) The Pebble Garden - This ornamental stone garden in colours and textures is tingling with the (almost) sound of small brooks, taking one away on those dreams of beautiful skies and beaches somehow in the confines of a space feeling very secure. 7) The Pink Pavillion - This is the place to go in order to get this summer feeling again, looking through a window frame from the pavillion, and getting enraptured by the rich green and pink colours of all that is in flower and bloom at the glorious height of summer time. Well, so far our extensions here. Why don't you join us in one of these new rooms and places? Try them out for yourselves, by scrolling down to the bottom of this page, and select any of these places (skins) from the drop down list you'll find there, the new extended one that is. P.S. : Guests, i.e., those not signed in, will only benefit from 1 additional skin, namely Vault. The last couple of months we have been working away at making some changes, hopefully for the better , here at FPN. You will have noticed undoubtedly the Blog, Downloads and Upload tabs already. Soon there will be a new Tab here, which will also make for a slight restructuring of the board. This is all about the Classifieds part of the Classifieds and Market Watch Section. We've had many requests regarding the limited functionality of the current format, limited mostly due to the restrictions imposed by the actual forum format in which it is embedded. Well, we can now announce that we are in the final stages of testing an entirely new subsystem for the board, which will allow for a variety of the wishes everybody had, including the moderators of the marketplace forums. First of all, posters of a Classified will be able to edit their classified(s) until the end of the run for a classified. Comments, questions, remarks etc. added by people interested in the item(s) on offer, will only be visible after the original poster has approved them, or he or she may even choose to keep a message or request private. He can also choose to re-edit the classified, and add any extra info based on questions other members may have, lowering the price, etc. This also means that any people posting a classified, will have to actively monitor them. Effectively, every member here will become the moderator of their own classifieds, although FPN still retains the right to moderate as well, of course. Also, several of the rules for posting a classified, have been incorporated in this add-on application. Let me mention a few here for starters . Addition of one or more pictures is mandatory. This is now controlled by the software. Everybody posting a classified has to attach at least 1 image. A thumbnail of this image will be created automatically, and this thumbnail will also be visible in the general or overall listing. Clicking on the thumbnail in the lisiting whill show the actual classified, and clicking on the thumbnail in the classified itself will then bring up the entire image in its full glory. Will this affect my overall storage here on FPN I can hear many people ask already? The good news is that it won't. Storage for pictures in Classifieds essentially is unlimited, the reason being that the number of classifieds is limited anyway for any time period, so this unlimited option is not going to pose any problems at all. This is another advantage of making this available as a separate piece of functionality rather than a part of the existing forum structure. It also allows one to save an image back to one's harddisk, for reuse, if necessary. And it also is still possible to add pictures via the image button in the editor too. In short, an old option stays, another old option now becomes mandatory, be it for a minimum of 1 image. You can add more if you like or prefer. Links to images are still not allowed. However, you can convert a link to an image to an actual image here by using Upload, although that will still only work for images which are not attached. And as mentioned, you always have to attach at least 1 image. 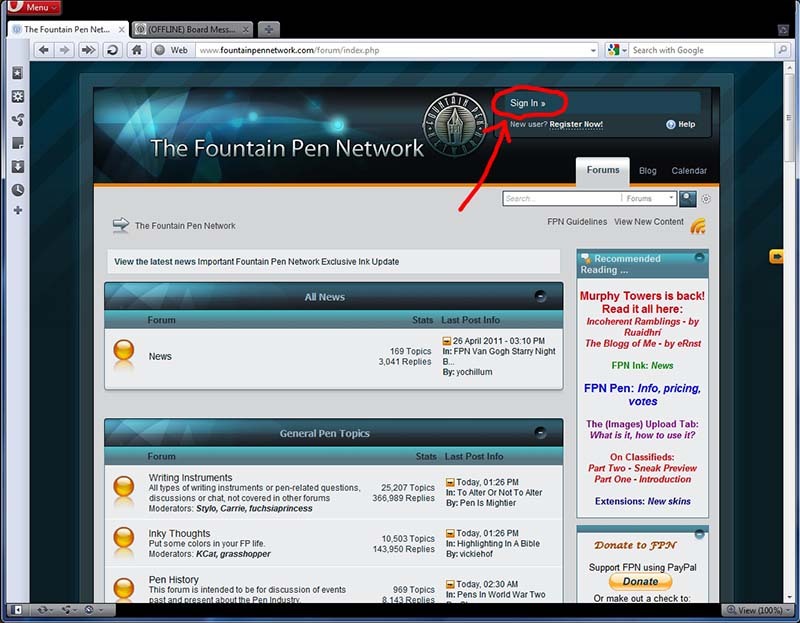 One of the older rules was that people who make it a habit or profession to sell pens and related items, were really supposed to post in the professional FS forum. There were a lot of complaints about this, so we have more or less allowed for pros and semi-pros alike to post in both and set a limit to the maximum number of posts per day to help the occasional sellers a little. However, with the new classifieds system that is no longer allowed, and we will rigorously act on this. A pure hobbyist who sells in the Low Volume category, is allowed to post three classifieds a week, with a maximum of 100 classifieds a year. Any more, and they will be removed. Anybody who starts posting in the Higher Volume category, is not allowed to post anymore in the Low Volume category. All of this to prevent swamping of the much fewer posts people add who are buying or selling pens to add to their collection, rather than for profit or as a business. However, it is possible to either view the individual category listings, or a combined one, so the same functionality as before has been maintained effectively, if so required. It really is even better from this POV. Furthermore, a poster will have to select from a "Shipping from:" dropdown list to indicate where the item is located, and this list includes all countries in the world, in principle anyway. Similarly, there is a "Shipping to" dropdown, although this is much more compact, and one of the options will be along the lines of "Other, to be described in the post itself". Payment options is another dropdown box, listing such possibilities as PayPal, etc., and again there will be an option for "Other". Obviously, there will also be a box for the price, and since we don't all use the same currency, all currencies of the world as far as we know, have been added to another dropdown list, with the most commonly used currencies on this board right at the top of the list. Do note that not filling in a price will result in the listing showing FREE in large bold capitals - best to be avoided IOW, unless that was the intention . All of these fields are mandatory fields so far. There are a few more however. Let me deal with those in the next episode of this likely three part article describing this new option, and maybe even accompanied with a preview or two . Playing with several more options we now have, we found a few quite useful. First of all there is a new "Upload" tab, and we also added a "Downloads" tab. Upload - it does exactly what it says and then some. It allows you to upload a file (picture) here, and provides you with the actual code to insert into a post in order to display the image too . Not only does it allow you to upload a picture from your PC, but also by entering a link. The latter feature is extremely useful for, e.g., reviews with photographs, because by using the Upload feature, any pictures can be uploaded here, and be preserved with the review rather than having to depend on allocation space available, etc. The Upload option will create a new tab or window, depending on your browser settings, when you open it, so it is easy to switch between a reply or post you are creating and the image(s) you want to add to your post or reply, and copy the code created for your image. We do hope this will make life a lot easier for many of our members here when it comes to attaching and inserting images in a post. There is 1 caveat with this option however, namely a limit to the size of the file uploaded. We've set it to 1 MB, but would prefer smaller files. This means resizing, in many cases, something which for now anyway, you will have to do yourself. A 1200 pixels wide by 800 pixels high picture (or vice versa), or 1000 X 1000 square should easily fit within this 1 MB limit, so resize to that size, and you should be fine. There are no limits on uploads currently, other than the 1 MB file size, but we would like to ask you to be considerate in the number of files you do upload, and the size you use, as the space here is limited . IOW, don't upload your last set of holiday photographs, but try to keep it limited to photographs or images which are relevant to a post you create or reply to. Do note that this option is only available to Gold Members, IOW, those members who were registered prior to January 23, 2010, and those who registered after that date who are registered for more than 30 days, and have more than 30 posts in relevant forums (i.e., not in Chatter) to their name. Downloads again implies what it does, namely the downloading of files from this site. What files? Quite simply, those handy files that people donated to FPN and its community, free for personal use. For now, you'll find here corienb's font files, a Seyes rules file, a nib size measuring chart, a link to Jonro's now famous fountain pen database, and a link to the iPhone/iPad app created by Invision to view FPN from iPhone or iPad. Note that in order to download any of these files, you have to be signed in to FPN. If you feel you do have something worthwhile to contribute in this regard, and want to share this with our members here, do feel free to contact us and discuss this, via PM or via email. Anyway, the admin team does hope you will enjoy these new additions to the site . Some of you may remember we actually were down for about 14 hours on January 8 or thereabouts. That was all necessary in order to make sure we could upgrade to the latest version of the entire software suite Invision provides for boards like our own Fountain Pen Network. One of the first benefits we got as a result is a very good Invision Community spam filter. And we got it just in time, too. On January 15 the internet was hit with a new deluge of spammers, and we certainly did and do get our share. The number of spammers increased very sharply from about 8-10 per day, to an average of over 120 a day! Fortunately we now get actually fewer who manage to get through than before we had the spam filter, so we uttered a big sigh of relief when we saw this filter in action . The great cleanup and reinstall also means that once we are familiar with some of the parts of the system, we will add an enhancement, and maybe even two, to the possibilities the board, and hence this site, has to offer, with a view to propel the Fountain Pen Network nicely and squarely into the modern age this new decade is promising us. We may even convince a few young newbies to come and join us that way, who knows . Anyway, as you can see, the admin blog is the first of some of the ideas we had. We are currently inventing stuff as we go, so there may be many more ideas which pop up and which may also disappear again, who knows. In the mean time, we do think this is a nicer way for communication between admins and members than the News forum, so personally, I reckon this may well be an option that will stay. Besides adding this blog, we also upgraded the system software, with an upgrade for better security, and there also is an upgrade for the iPhone and iPad App, which can be gotten at the Apple AppStore, for free: iPhone + iPad App for IP.Board. I do hope you will all enjoy these new developments.